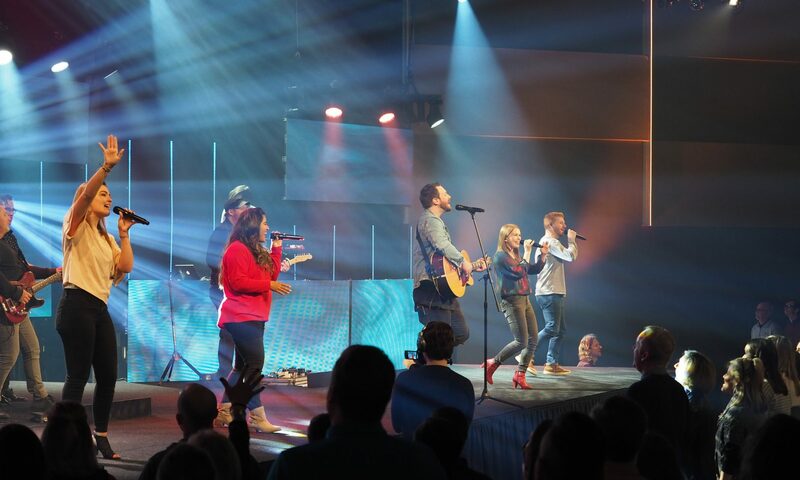 What lighting console is best for worship lighting? The best lighting console is the one you know how to use. – Every Lighting Designer on earth. Yes, that is a little too simplistic, but it is true. If you know every trick in the book on one lighting console, that is probably the lighting console you should be using. But I assume you want me to point you down the road and tell you what to buy. I would buy the Grand MA2, or maybe the 3 for one simple reason. It is the most widely used desks in the world. There are plenty of them available if something happens to yours and lots of programmers. Now that everyone knows what I would buy, let us talk about what your church should buy and why. I don’t expect your church will approve the $60,000-$70,000 you will need for a Grand MA 2 or 3, so let us talk real numbers. There are great options for lighting consoles under $2000 like the ECT Colorsource 20, but even greater options around $5,000-$10,000 range like the High-End HedgeHog 4. So what do you really need to know before you pick a lighting desk? Everyone wants an easy to use lighting desk that is volunteer friendly. So let’s set up your volunteers up for a win and make sure we pick a desk that has a good training system or videos. For years the Jands Vista was touted as an easy desk for volunteers. I am not actually sure why, but I am guessing it was the graphical interface. But most desks had that at the time, so maybe it was something else. It is/was popular with lots of churches for reasons that I never really understood. It did have some great training videos online. Our church has one and I find it extremely lacking in features, but everyone else loves it so we have it for now. If you can’t find online videos or training manuals for the desk then you need to make some. It does not really matter what desk you buy if you can break down the steps of how to use it into several short videos to share with your volunteers it will be easy to use. Of course, all lighting desks have similar features and all do the same thing. So rent a desk or two before you buy one and try them out for a month at a time. Make sure you know how to use something before you buy it. Even if your church does not have a full time lighting person, someone on staff needs to be the expert that can teach everyone else. Does your lighting console need to control moving lights? I know I know, everyone wants moving lights, but the reality is that they are too expensive for many churches to do well. Most churches would be better off buying a bunch of conventional lights that actually light things than painting the air with pretty beams. For this reason, you may not need to spend much on a lighting desk. Lighting consoles like the ETC Color source, Leprecon LPC, or Pathway Cognito2 would make great desks for a conventional rig. They are very inexpensive and some of them like the color source family even have built-in FAQ’s and How To’s and online training. I can’t really imagine a simpler type of desk. While these desks can program moving lights, if you are going to use more than 4 or 6 moving lights I would be upgrading to a Hog, Vista, GrandMA, or ChamSys type desk. Upgrading to moving lights and a moving light console will double if not triple your programming time. And also make it a lot harder for your volunteers. Remember that one moving light is 20-30 more parameters to control than a single conventional light. I typically spend 30-45 minutes on programming for a single song to program moving lights for our church. If you are going the direction of a full-blown moving light console for your worship look you are going to want to make sure it is expandable and upgradable. It is very likely that if you dump 20-30k into a lighting console you are going to need to use it for a few year before you get a new one. Because of this, we want to make sure the hardware is new enough technology that it will take software updates. There is not much worse than buying a new desk that is obsolete a year later. Make sure you ask when the model you are buying was released. Buying a new desk built on a 5 year old design will limit the usable life time for the desk. Technology changes so fast that you want to look for desks that came out in the last 2 to 3 years. Those are old enough to have been tested but still young enough to still be supported. Expandability is another big topic. If you think you are going to be adding a bunch of moving lights or media servers over the years it would be important to have desk that you can expand the perimeter count for. Buying 512 channels or 1 DMX universe may be fine now, but if you need more down the road you don’t want to have to buy a whole new system. Still, need help picking out your lighting desk? 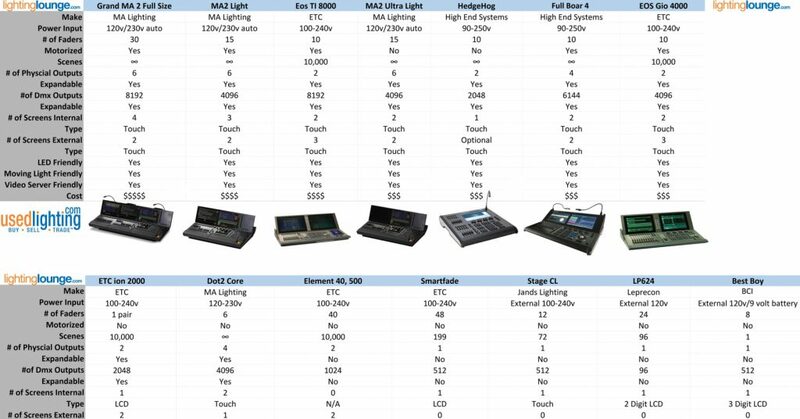 I know we covered a lot here if you are still unsure what kind of lighting desk is best for you to reach out and ask. Below is a form you can fill out to start the conversation. I am happy to lend advise about what I would do in your situation. I don’t represent any company or make any commission on these sales. Reach out and let’s chat. Tell me what kind of set up you have now.